Human Rights Activists News Agency (HRANA) – Azerbaijani activist and Tabriz resident Nasim Sadeghi was arrested by security forces on her walk home October 21st. On a phone call with her child from an undisclosed location, she explained that she had been taken into custody. Confirming the news of Sadeghi’s arrest, a close source told HRANA that security forces also confiscated her personal belongings, including her cell phone, computer, and books. No further information is available on her location or the charges against her. On July 28, 2016, Sadeghi was among dozens apprehended for their participation in a public protest against controversial comments published in the newspaper Tarh-e No. 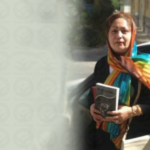 The Prosecutor’s Interrogation Office of Tabriz Revolutionary Court Branch 7 accused her of acting against national security through propaganda against the regime, interrogating her for five days in the Intelligence Detention Center of Tabriz. She was released on a bail of 1 billion IRR (approximately $8000 USD) pending trial. In June 2017, HRANA reported on Sadeghi’s summons to Branch 1 of Tabriz Revolutionary Court for continued judicial proceedings. HRANA News Agency – Following the protests in various cities of Azerbaijan and Ardebil provinces in response to an article which was published in the newspaper of “Tarhe No”, a wave of arresting protesters in these cities began. 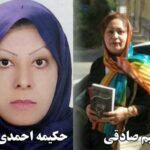 Gradually, the identities of some of them who were arrested or sent to judicial centers have been verified: Nasim Sadeghi in Tabriz and Mohamamd Jolaei, Hossein Balakhani, and Ahmad Mohammadzadeh in Ardebil are the activists who were released on the bail recently. 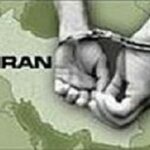 However it has been reported that Babak Hosseini Moghaddam was arrested in Tabriz. HRANA News Agency – Following the protests in various cities of Azerbaijan and Ardebil provinces in response to the article published in the newspaper of “Tarhe No” and the continuation of the protests in recent days, a wave of arrests of protesting citizens in these cities has begun. The latest list of names or those who were arrested or released from custody and also, the latest status of 31 of these individuals follows.